Yesterday several NATO countries ran a concerted propaganda campaign against Russia. The context for it was a NATO summit in which the U.S. presses for an intensified cyberwar against NATO’s preferred enemy. On the same day another coordinated campaign targeted China. It is aimed against China’s development of computer chip manufacturing further up the value chain. Related to this is U.S. pressure on Taiwan, a leading chip manufacturer, to cut its ties with its big motherland. There has been an ongoing campaign on the part of the US, to get out the idea that China, Russia, North Korea, and Iran have massive armies of hackers that are constantly looking to steal American secrets. The absurdity of the US’ claims is pretty obvious. As I pointed out in my book The Myth of Homeland Security (2004) [wc] claims such as that the Chinese had “40,000 highly trained hackers” are flat-out absurd and ignore the reality of hacking; that’s four army corps. Hackers don’t engage in “human wave” attacks. “The Great US/China Cyberwar of 2010” is one cyberwar that didn’t happen, but was presaged with a run-up of lots of claims that the Chinese were hacking all over the place. I’m perfectly willing to accept the possibility that there was Chinese hacking activity, but in the industry there was no indication of an additional level of attack or significance. One thing that did happen in 2010 around the same time as the nonexistent cyberwar was China and Russia proposed trilateral talks with the US to attempt to define appropriate limits on state-sponsored hacking. The US flatly rejected the proposal, but there was virtually no coverage of that in the US media at the time. The UN also called for a cyberwar treaty framework, and the effort was killed by the US. [wired] What’s fascinating and incomprehensible to me is that, whenever the US feels that its ability to claim pre-emptive cyberwar is challenged, it responds with a wave of claims about Chinese (or Russian or North Korean) cyberwar aggression. John Negroponte, former director of US intelligence, said intelligence agencies in the major powers would be the first to “express reservations” about such an accord. US ideology is that “we don’t start wars” – it’s always looking for an excuse to go to war under the rubric of self-defense, so I see these sorts of claims as justification in advance for unilateral action. I also see it as a sign of weakness; if the US were truly the superpower it claims it is, it would simply accept its imperial mantle and stop bothering to try to justify anything. I’m afraid we may be getting close to that point. The Netherland [sic] for its part released a flurry of information about the alleged spying attempts against the OPCW in The Hague. It claims that four GRU agents traveled to The Hague on official Russian diplomatic passports to sniff out the WiFi network of the OPCW. (WiFi networks are notoriously easy to hack. If the OPCW is indeed using such it should not be trusted with any security relevant issues.) The Russian officials were allegedly very secretive, even cleaning out their own hotel trash, while they, at the same, time carried laptops with private data and even taxi receipts showing their travel from a GRU headquarter in Moscow to the airport. Like in the Skripal/Novichok saga the Russian spies are, at the same time, portrayed as supervillains and hapless amateurs. Real spies are neither. There’s a lot there, and I think the interpretation is a bit over-wrought, but it’s mostly accurate. The US and the UK (and other NATO allies, as necessary) clearly coordinate when it comes to talking points. Claims of Chinese cyberwar in the US press will be followed by claims in the UK and Australian press, as well. My suspicion is that this is not the US Government and UK Government coordinating a story – it’s the intelligence agencies doing it. My opinion is that the intelligence services are fairly close to a “deep state” – the CIA and NSA are completely out of control and the CIA has gone far toward building its own military, while the NSA has implemented completely unrestricted surveillance worldwide. It’s hard to keep score because everything is pretty vague, but it sounds like the US has been dramatically out-spending and out-acting the other nations that it accuses of being prepared for cyberwar. I tend to be extremely skeptical of US claims because: bomber gap, missile gap, gulf of Tonkin, Iraq WMD, Afghanistan, Libya and every other aggressive attack by the US which was blamed on its target. The reason I assume the US is the most aggressive actor in cyberspace is because the US has done a terrible job of protecting its tool-sets and operational security: it’s hard not to see the US is prepared for cyberwar, when both the NSA and the CIA leak massive collections of advanced tools. Meanwhile, where are the leaks of Russian and Chinese tools? They have been few and far between, if there have been any at all. Does this mean that the Russians and Chinese have amazingly superior tradecraft, if not tools? I don’t know. My observation is that the NSA and CIA have been horribly sloppy and have clearly spent a gigantic amount of money preparing to compromise both foreign and domestic systems – that’s bad enough. With friends like the NSA and CIA, who needs Russians and Chinese? I wrote a piece about the “Farewell Dossier” in 2004. [mjr] Re-reading it, it comes off as skeptical but waffly. I think that it’s self-promotion by the CIA and exaggerates considerably (“look how clever we are!”) at a time when the CIA was suffering an attention and credibility deficit after its shitshow performance under George Tenet. But the first known cases of computer related supply chain manipulation go back to the 70s and 80s – the NSA even compromised Crypto AG’s Hagelin M-209 system (a mechanical ciphering machine) in order to read global communications encrypted with that product. You can imagine Crypto AG’s surprise when the Iranian secret police arrested one of their sales reps for selling backdoor’d crypto – the NSA had never told them about the backdoor, naturally. The CIA was also on record for producing Xerox machines destined for the USSR, which had recorders built into them So, while the article is portraying the historical sweep of NSA dirty tricks, they’re only looking at the recent ones. Remember: the NSA also weakened the elliptic curve crypto library in RSA’s Bsafe implementation, paying RSADSI $13 million to accept their tweaked code. The Russians and Chinese are doing it, they’re just so darned good nobody has caught them until just recently. The Russians and Chinese simply resort to using existing tools developed by the hacking/cybercrime community and rely on great operational security rather than fancy tools. The Russian and Chinese efforts are relatively tiny compared to the massive efforts the US expends tens of billions of dollars on. The US spends about $50bn on its intelligence agencies, while the entire Russian Department of Defense budget is about $90bn (China is around $139bn) – maybe the Russians and Chinese have such a small footprint because they are much smaller operations? That brings us to the recent kerfuffle about taps on the Supermicro motherboards. That’s not unbelievable at all – not in a world where we discover that Intel has built a parallel management CPU into every CPU since 2008, and that there is solid indications that other processors have similar backdoors. Was the Intel IME a “backdoor” or just “a bad idea”? Well, that’s tricky. Let me put my tinfoil hat on: making a backdoor look like a sloppily developed product feature would be the competent way to write a backdoor. Making it as sneaky as the backdoor in the Via is unnecessary – incompetence is eminently believable. I believe all of these stories (including the Supermicro) are the tip of a great big, ugly iceberg. The intelligence community has long known that software-only solutions are too mutable, and are easy to decompile and figure out. They have wanted to be in the BIOS of systems – on the motherboard – for a long time. If you go back to 2014, we have disclosures about the NSA malware that hides in hard drive BIOS: [vice] [vice] That appears to have been in progress around 2000/2001. But Equation Group’s malware platforms have other tricks, too. GrayFish, for example, also has the ability to install itself into computer’s boot record – software that loads even before the operating system itself – and stores all of its data inside a portion of the operating system called the registry, where configuration data is normally stored. 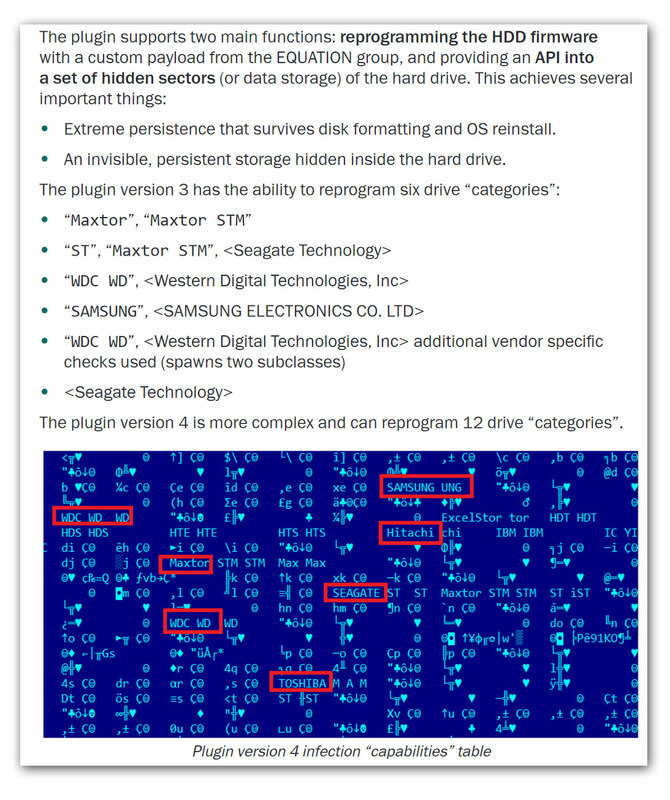 EquationDrug was designed for use on older Windows operating systems, and “some of the plugins were designed originally for use on Windows 95/98/ME” – versions of Windows so old that they offer a good indication of the Equation Group’s age. Let me be clear: I think we are fucked every which way from the start. With backdoors in the BIOS, backdoors on the CPU, and wireless cellular-spectrum backdoors, there are probably backdoors in the GPUs and the physical network controllers, as well. Maybe the backdoors in the GPU come from the GRU and maybe the backdoors in the hard drives come from NSA, but who cares? The upshot is that all of our systems are so heinously compromised that they can only be considered marginally reliable. It is, literally, not your computer: it’s theirs. They’ll let you use it so long as your information is interesting to them. Do I believe the Chinese are capable of doing such a thing? Of course. Is the GRU? Probably. Mossad? Sure. NSA? Well-documented attribution points toward NSA. Your computer is a free-fire zone. It has been since the mid 1990s, when the NSA was told “no” on the Clipper chip and decided to come up with its own Plan B, C, D, and E. Then, the CIA came up with theirs. Etc. There are probably so many backdoors in our systems that it’s a miracle it works at all. The problem is that playing in this space is the purview of governments. Nobody in the cybercrime or hacking world need tools like these. The intelligence operatives have huge budgets, compared to a typical company’s security budget, and it’s unreasonable to expect any business to invest such a level of effort on defending itself. So what should companies do? They should do exactly what they are doing: expect the government to deal with it; that’s what governments are for. The problem with that strategy is that their government isn’t on their side, either! It’s Hobbes’ playground. In case you think I am engaging in hyperbole, I assure you I am not. If you want another example of the lengths (and willingness to bypass the law) “they” are willing to go, consider ‘stingrays’ that are in operation in every major US city and outside of every interesting hotel and high tech park. Those devices are not passive – they actively inject themselves into the call set-up between your phone and your carrier – your data goes through the stingray, or it doesn’t go at all. If there are multiple stingrays, then your latency goes through the roof. “They” don’t care. Are the stingrays NSA, FBI, CIA, Mossad, GRU, or PLA? Probably a bit of all of the above depending on where and when. Whenever the US gets caught with its pants down around its ankles, it blames the Chinese or the Russians because they have done a good job of building the idea that the most serious hackers on the planet at the Chinese. I don’t believe that we’re seeing complex propaganda campaigns that are tied to specific incidents – I think we see ongoing organic propaganda campaigns that all serve the same end: protect the agencies, protect their budgets, justify their existence, and downplay their incompetence. So, with respect to “propaganda” I would say that the US intelligence community has been consistently pushing a propaganda agenda against the US government, and the citizens in order to justify its actions and defend its budget. The government also engages in propaganda, and is influenced by the intelligence community’s propaganda as well. And the propaganda campaigns work because everyone involved assumes, “well, given what the NSA has been able to do, I should assume the Chinese can do likewise.” That’s a perfectly reasonable assumption and I think it’s probably true that the Chinese have capabilities. The situation is what Chuck Spinney calls “A self-licking ice cream cone” – it’s a justifying structure that makes participation in endless aggression seem like a sensible thing to do. And, when there’s inevitably a disaster, it’s going to be like a cyber-9/11 and will serve as a justification for even more unrestrained aggression. What little I’ve been able to find out the new Trump™ cybersecurity plan is that it doesn’t involve any defense, just massive retribution against (perceived) foes. Funny how those obsessed with “false flag” operations work so hard to invite more of same. Yes. 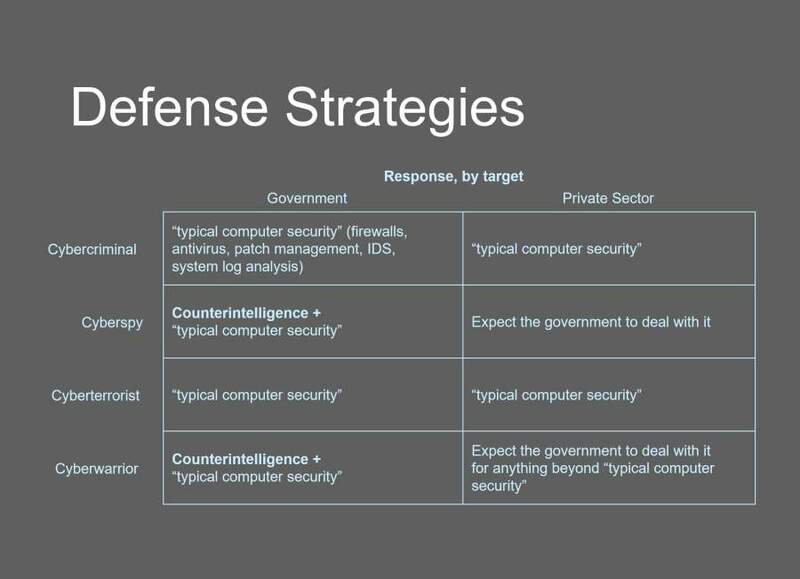 Since 2001, as far as most of us can tell, federal cybersecurity spend has been 80% offense, 20% defense. And a lot of the offensive spend has been aimed at We, The People. Your mention of Operation Sundevil and Kevin Mitnick in a previous post made me think that maybe the reason we haven’t seen the kind of leaks from the Russian and Chinese hacking operations that we’ve seem from the NSA is that they’re running a “Kevin Mitnick style” operation; that is, relying less on technical solutions and using instead old-fashioned “social engineering” and other low-tech forms of espionage (like running troll farms on social media). I mean, I’ve seen interviews with retired US intelligence people since the 90s complain that since the late 1980s, the intelligence agencies have been crippled by management in love with hi-tech “SIGINT” solutions to problems that never deliver and neglecting old-fashioned “HUMINT” intelligence-gathering. The thing is, Kevin Mitnick got away with a lot of what he did because people didn’t take security seriously then, and still don’t. On a similar nostalgia vibe, I remember reading an article by Keith Bostic (one of the researchers who helped in the analysis of the Morris worm that took down a significant chunk of the Internet back in 1988) where he did a follow-up a year or so afterwards and some depressing number of organisations that had been hit by it still hadn’t patched the holes that had let the worm infect them in the first place. Your mention of Operation Sundevil and Kevin Mitnick in a previous post made me think that maybe the reason we haven’t seen the kind of leaks from the Russian and Chinese hacking operations that we’ve seem from the NSA is that they’re running a “Kevin Mitnick style” operation; that is, relying less on technical solutions and using instead old-fashioned “social engineering” and other low-tech forms of espionage (like running troll farms on social media). I think that’s right, to a high degree. What if Edward Snowden was an agent provocateur instead of a well-meaning naive kid? A tremendous amount of damage could be done, as well as stealing the US’ expensive toys. The Russians have been very good at doing exactly that sort of operation, since WWII. The Chinese are, if anything, more subtle than the Russians. The Chinese attitude, as expressed to me by someone who might be a credible source is, “why are you picking a fight with us? We don’t care, you’re too far away for us to threaten you, we both have loads of our own fish to fry. To them, the US is young, hyperactive, and stupid. The FBI is not competent, at all, against old-school humint intelligence-gathering. Compared to the US’ cyber-toys, the old ways are probably more efficient and cost effective. China’s intelligence community is also much more team-oriented than the CIA/NSA; they’re actually a disciplined operation under the strategic control of policy-makers. That, by the way, is why Russians and Chinese stare in amazement when Americans ask things like “Do you think Putin knew about this?” What a stupid question! It’s an autocracy; they don’t have intelligence operatives just going an deciding “it’s a nice day to go to England with some Novichok.” The entire American attitude toward espionage lacks maturity. On a similar nostalgia vibe, I remember reading an article by Keith Bostic (one of the researchers who helped in the analysis of the Morris worm that took down a significant chunk of the Internet back in 1988) where he did a follow-up a year or so afterwards and some depressing number of organisations that had been hit by it still hadn’t patched the holes that had let the worm infect them in the first place. That as an exciting time. We were downstream from University of Maryland, which got hit pretty badly. Pete Cottrel and Chris Torek from UMD were also in on Bostic’s dissection. We were doing uucp over TCP for our email (that changed pretty soon after the worm) and our uucp queue blew up. I cured the worm with a reboot into single-user mode and a quick ‘rm -f’ in the uucp queue.